Get answers to your questions about SAR. Do SAR values change when a mobile phone is repaired? Repairs carried out by an authorized distributor or service center do not influence the SAR values of the mobile phone. Do SAR values change when a mobile’s OS is updated? Original OS updates from the manufacturer are designed to improve the software functioning in the device and do not affect any radio settings including SAR values. If I am on my mobile device searching the Internet and I receive a mobile call – can the published SAR value of the device be exceeded? SAR values also cover the situation when a mobile device accesses multiple services simultaneously. Are mobile phones with a low SAR rating a safer choice? The SAR values reported for each model of mobile phone tend to significantly overstate real-life exposure levels. All models of phones are tested to ensure they meet exposure standards even at maximum power levels - they indicate the worst case exposure in a laboratory test situation. However, mobile phones tend not to operate at maximum power levels during everyday use. In order to avoid network interference, improve battery life and available call time, mobile phones constantly adapt to the minimum power required to maintain a quality call. Also, if consumers, despite the science that supports the safety of phones compliant with SAR standards, want to reduce their exposure to cell/mobile phone emissions then there are more effective ways to do this - the World Health Organization (WHO) and the US Food and Drug Administration (FDA) agree the best way to reduce exposure is by limiting your phone calls or simply using a hands-free kit to keep the phone away from your head and body. But don't wired hand-free kits transfer and focus the radio waves into my brain? A number of people continue to be concerned and have been misinformed about the effectiveness of mobile phone hands-free kits. In April 2000 an article was published by the British Consumers' Association that report their own research found the use of personal hands-free kits might increase the radiofrequency (RF) energy absorbed by the head of a user because the radio waves could travel up the hands-free device wire. However, a series of independent tests prompted by the 'Which?' magazine article, have shown hand-free kits reduce exposure significantly. For example, the Department of Trade and Industry (DTI) in Britain published a research report in July 2000 soon after the 'Which?' article appeared, specifically on hands-free kits. The research found personal hands-free kits used normally, with the earpiece cable hanging naturally from the ear, reduce exposure by 93 to 98 per cent. In their intended mode of use, personal hands free kits offer very substantial reductions in SAR [exposure] compared to the normal use of a mobile phone held against the ear. Because of the complex nature of RF-exposure dosimetry, human exposure measurements from RF transmitters in the near field should be conducted only by laboratories with specific experience in this area and should conform to internationally accepted measurement procedures. What about the emissions from Bluetooth hands-free devices? Hands-free kits which use Bluetooth wireless signals to transfer voice information are extremely low powered because they only transmit the information over very short distances. A study by researchers from the Foundation for Research on Information Technologies in Society (IT'IS) in Zurich tested mobile phones with a range of wired and Bluetooth wireless Hands Free Kits (HFK). In general, a wired HFK considerably reduces the exposure of the entire head region compared to mobile phones operated at the head, even under unlikely worst-case coupling scenarios. What about products that claim to shield me from the exposure? Products which claim to reduce the radio emissions for mobile phones or disrupt radio wave frequencies either do not work or might reduce the connection of the mobile phone to the network causing the phone to increase its power output. The use of commercial devices for reducing radio frequency field exposure has not been shown to be effective. In May 2002, the UK’s Department of Trade and Industry (DTI) published a report into the effectiveness of mobile phone shielding and absorbing devices. The report found these devices either did not work at all or that they significantly interfered with the normal operation of the phone and that the phone's performance was 'sharply reduced' in weak signal areas and when used inside buildings. Do children need to take additional precautions? It is entirely understandable that some parents may be concerned about mobile phone safety and their children's use of mobiles. Concerns have been raised about the possibility of greater vulnerability for children because of an increased susceptibility to health risks during developmental stages and because young people will use mobile phones for most of their lives. However, a number of independent reviews of all available science by international health authorities and governments have carefully considered this concern and found no evidence of any additional risk to children from mobile phone technologies. In summary, although a substantial amount of research has been conducted in this area, there is no convincing evidence that RF field exposure below guideline levels causes health effects in adults or children. Available data do not indicate that exposure to radiofrequency electromagnetic fields affect brain development or health in children. Also, international safety standards have taken these concerns and potential risks into account when setting safe exposure limits. The guidelines have been developed using worst-case scenarios and include added safety margins to ensure children are protected. The protection system using basic restrictions and reference levels makes the ICNIRP guidelines flexible and applicable to virtually any exposure condition, and any group of population. Therefore, there is no need, or justification, for a special approach to the protection of children. Does my exposure change if I am close to a base station? Mobile phones tend not to operate at maximum power levels during everyday use. In order to improve battery life and available call time, mobile phones constantly adapt to the minimum power required to make a quality call depending on reception and how close they are to the nearest base station. A mobile phone that is close to the nearest base station will usually require less power to operate than the same mobile phone that is transmitting a call from further away. If base stations are placed closer to users, the power level required for communications usually decreases, and so too does the emissions from base stations and mobile phones. How are mobile phones tested? 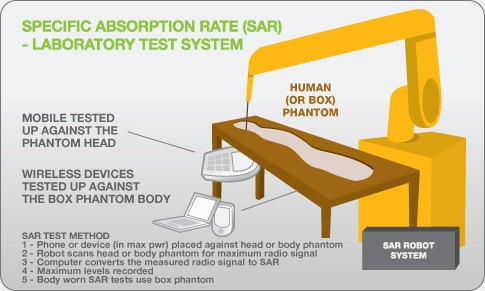 Each model of mobile phone is tested using both a 'phantom' head and a separate 'phantom' torso for body-worn measurements. The phantoms are filled with liquids that simulate human tissue and SAR values are measured with the phone at maximum power while operating at its different frequencies and placed in a number of normal use positions. The test procedures measure each model of phone in a range of positions when held to the ear to make a phone call. Phones are also tested in body-worn configurations using belt-clips, holsters or similar accessories if they are provided or at a slight distance from the phantom to simulate clothing or the intended use of the phone. A probe inside the liquid measures the electric field strength inside the phantom and shows the maximum SAR value for the model of mobile phone. It is a complex procedure which including the testing of phone accessories can take up to two weeks. This video clip takes a look inside a SAR measurement laboratory where a mobile phone is being put through the rigorous SAR testing process. Video courtesy of Ericsson. Why do health authorities like the American Cancer Society say consumers should choose a low SAR handset? Doesn't this contradict what you are saying? The way phones work and SAR is complex and it is entirely understandable that some health organisations will include precautionary advice which is inconsistent with how SAR works. This is probably why the US Federal Communications Commission (FCC) has released a consumer fact sheet titled: 'SAR For Cell Phones: What It Means For You'. The fact sheet was designed to address the considerable confusion and misunderstandings about the meaning of the maximum reported SAR values for cell phones. Many people mistakenly assume that using a cell phone with a lower reported SAR value necessarily decreases a user's exposure to RF emissions, or is somehow "safer" than using a cell phone with a high SAR value. While SAR values are an important tool in judging the maximum possible exposure to RF energy from a particular model of cell phone, a single SAR value does not provide sufficient information about the amount of RF exposure under typical usage conditions to reliably compare individual cell phone models. ALL cell phones must meet the FCC's RF exposure standard, which is set at a level well below that at which laboratory testing indicates, and medical and biological experts generally agree, adverse health effects could occur. For users who are concerned with the adequacy of this standard or who otherwise wish to further reduce their exposure, the most effective means to reduce exposure are to hold the cell phone away from the head or body and to use a speakerphone or hands-free accessory. These measures will generally have much more impact on RF energy absorption than the small difference in SAR between individual cell phones, which, in any event, is an unreliable comparison of RF exposure to consumers, given the variables of individual use. Most manufacturers of mobile phones now carry a small print warning associated with holding devices too close to the body. Is the mobile phone industry concerned about safety when handsets are used up close to the body? Like most other consumer goods, mobile phone manuals advise owners on appropriate use for various situations. Some manuals recommend distances that mobile phones should be kept away from the body (not the ear or head). Every mobile phone model is tested to make sure they meet national and international exposure limits for exposure to radiofrequency emissions, before they can be sold in each market around the world. The test procedures measure each model of phone in the usual position held to the ear, when making phone calls. For use when not held to the ear, phones are tested at distances intended to represent belt-clips, holsters or similar accessories or at a small distance from the trunk of the body to simulate the effect of clothing or the intended type of use. The information in manuals reflects how phones are tested for compliance and how they should be used to ensure they meet standards at maximum power levels. All of these tests are done at the maximum power of the phone, even though in normal use, phones operate at lower power levels, adapting constantly to use the minimum power required to make a call in order to maximise battery life and available call time. Mobile phone manuals typically advise owners about best practices when using mobile phones and to only use them in the intended use positions, such as next to the ear, when making or receiving a call. Mobile phones generally get better reception when used away from the main part of the body. Some mobile phone handset manuals mention using a belt-clip. Does not using a belt-clip pose a health risk? The test procedures measure each model of phone at distances intended to represent belt-clips, holsters or similar accessories or at a small distance from the trunk of the body to simulate the effect of clothing or the intended type of use - and it is this distance that is included in user manuals. If a consumer does not comply with the manufacturer's recommendations for a body worn separation distance, safety is not compromised because the standards have large built-in safety margins, which protect the user. The SAR limit for the general public includes an added safety factor of 50 fold and for workers the safety factor is 10 fold. Why do different manufactures recommend different distances handsets should be used from the body? Are some handsets safer than others? These reflect the distances, used in the standard test procedure, where a phone will be away from the body due to the use of belt-clips, holsters or similar accessories and within the safety limits at maximum power. This can be different for each different model of phone and the accessories supplied. It should be remembered that the testing of mobile phones - whether held to the ear or for body-worn situations - is done to ensure they comply with the standards at maximum power levels. Mobiles mostly do not operate at maximum power and adapt to the minimum power to maintain a quality call depending on the reception and how close they are to the nearest base station. The SAR tests involve using a dummy of a man 6ft 2inches tall, weighing 200 pounds. Cleary this is not representative of the average mobile user. Is this model used to reduce the SAR values of phones? A large adult male model head - known as SAM (Specific Anthropomorphic Mannequin) - is used so that international SAR compliance tests give conservative results. SAM's dimensions were deliberately taken from the 90th-percentile of an adult male in the US Army in order to cover the vast majority of the population. More importantly, the larger the head the larger the amount of energy will be absorbed in the SAR tests - which represents the worst case and gives a conservative SAR measurement. The primary design goal of the standard setting body for SAM was that, "SAM shall produce a conservative SAR for a significant majority of persons during normal use of wireless handset". Research has been done to confirm the model produces conservative SAR values for the whole population including children. This leads us to conclude that the SAM does produce a conservative estimate of SAR in the head and assures compliance with respect to the international exposure guidelines. The larger (adult) head resulted in a statistically higher peak SAR than did the smaller (child) head for all conditions. If I am concerned - what can I do? The power (and hence the radiofrequency exposure to a user) falls off rapidly with increasing distance from the handset. A person using a mobile phone 30–40 cm away from their body – for example when text messaging, accessing the Internet, or using a “hands free” device – will therefore have a much lower exposure to radiofrequency fields than someone holding the handset against their head.